I’m SO excited to welcome Natasha from Natural Urban Mama as my final guest for Sling Fling! Natasha owns a super cute online baby boutique, so who better to dispense some advice on how to choose a carrier? AND, if you have any questions, you can find her on Twitter @naturalurbanmom. It’s a fact mamas: babies who are held and carried cry less, are more calm and content, sleep more peacefully, nurse and gain weight better, they enjoy better digestion and physically and mentally develop better. (1, 2, 3) With all of these incredible benefits, babywearing seems like a no-brainer for new parents. But choosing and then using a baby carrier can be daunting for some. There are so many to choose from? And how do you know which is best for you, your baby and your budget? Different carriers have different features and benefits and some are more appropriate for different ages and stages of your child. It is important to seek advice and instruction (whether in person or online) about different carriers and if you can, try out a few before you make your decision (your mama friends, natural parenting stores and your local La Leche League meetings are good places to start). Also consider who else will be wearing the baby. Daddy, grandparents, older siblings and other caregivers can all be taught to wear your little bundle as well and this may be part of the deciding factor when choosing a carrier. 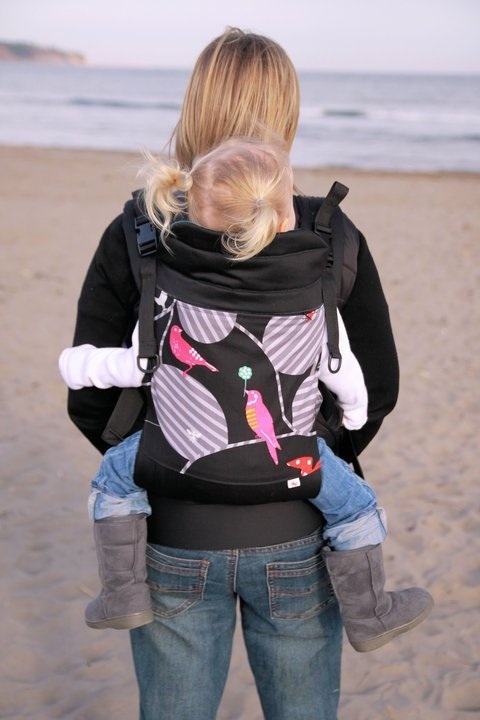 Here is my run down of the main kinds of baby carriers that I recommend, what I think are the pros and cons of each, the costs and a few recommended brands. Fabric does not have any stretch to it and therefore can be used from newborn to toddler hood. Excellent for all kinds of tummy-to-tummy, hip and back carrying. Higher learning curve than stretchy wraps and takes practice to master. Because it is a one shouldered carrier, weight of baby is not totally evenly distributed and may cause some discomfort after longer periods of wearing. Two-shouldered carriers that evenly distribute weight of baby across the wearers back & on their hips. Great for traveling, hiking or anytime you need to wear baby for extended periods of time. Most buckle carriers are not recommended for newborns. Babywearing is a wonderful practice and one that I truly believe can make your brave new journey into parenthood that much easier. It can be done from day one with your newborn all the way up to toddlerhood and sometimes beyond! (I happen to know a few 4 year olds who still enjoy a ‘piggy back’ on Mama). So don’t give up if the first one you try doesn’t feel right. Keep trying different carriers until you find the one (or two or three) that works for you and your baby. Natasha Chiam is a Certified Babywearing Educator and the Chief Executive Mama at Natural Urban Mamas. She is mama to a four year old boy and a two year old girl, both of whom she still ‘wears’ on a regular basis. You can also find her on Twitter @naturalurbanmom and read her blog HERE. Thanks so much to Natasha for all of that information! This is the first ever post on my blog with footnotes and that? kind of rocks. Don’t forget to visit Natasha on her blog and on Twitter. And thank you again to all of my fabulous guest posters for Sling Fling week – we’ve had so many great stories! « Natalie from Babywearing It Up – Babywearing Sling Fling Week! What a great informative article!! This is sure to be a great resource for anyone starting out babywearing! Thank you very much for this post. It was very informative and something I'll be sure to bookmark to look at when we have another child.